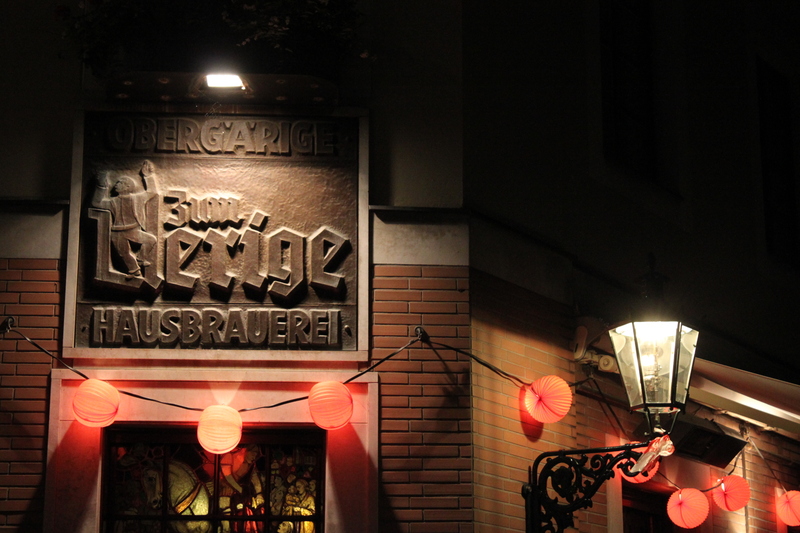 Zum Uerige is no shrinking violet on the beer scene- it has been serving weary travellers for hundreds of years (perhaps). Service is brisk and efficient (in Germany?!) and the waiters tally up your drinks on your beer mat, which acts as your tab, and possibly also inspires competition amongst friends, depending on your drinking style. Quiet a few patrons on travel review websites find this rude- it’s busy, the servers wonder around offering fresh beers already poured, so I think conventional serving would really slow things down. 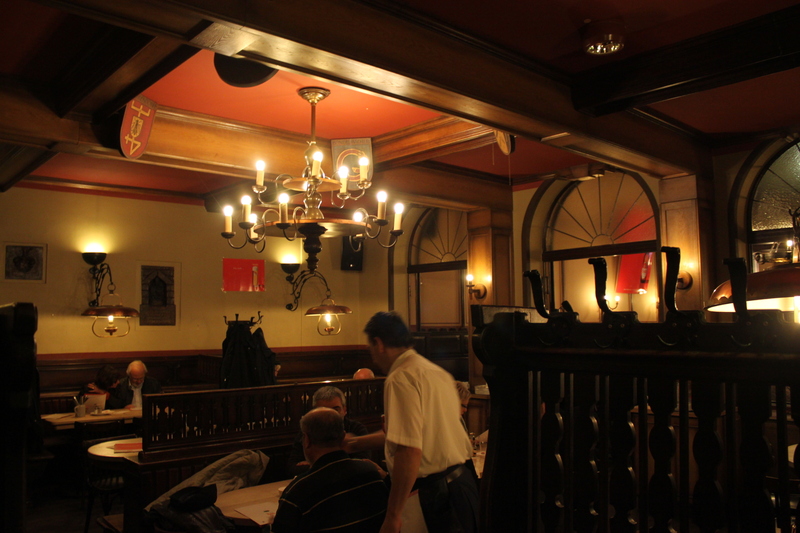 This was our third beer hall of the day, and we both found it much more characterful than Cologne’s two offerings (see Früh am Dom and Brauhaus Sion). Why is everyone moving so fast…? 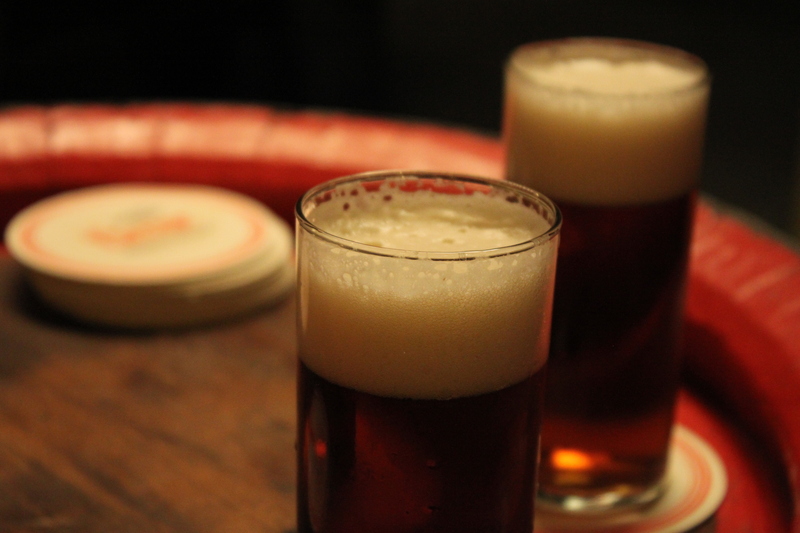 The Uerige alt beer is style-defining, and rightfully so: delicious. 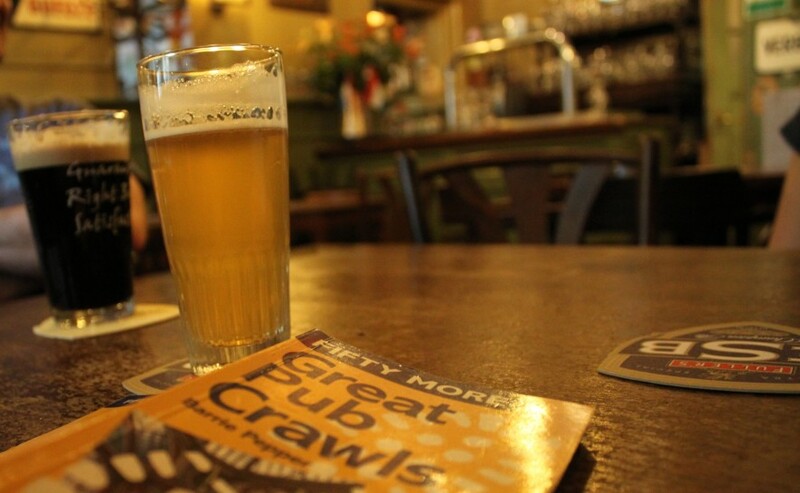 There are a variety of rooms, some supporting dining and others promoting vertical drinking. This adds depth and, crucially, keeps the noise down. 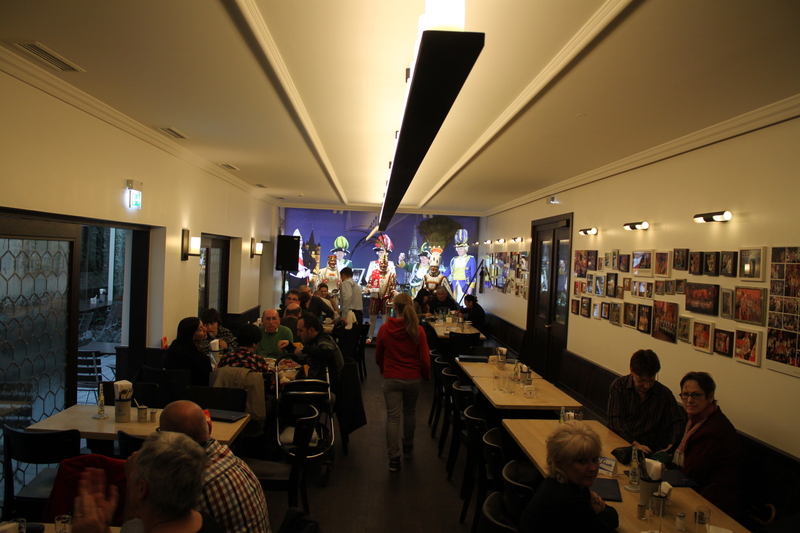 The prices are fair and the grub is typical German bar food- pig and pickled things. We had goulash which was packed with very generously sized stewed meat. Hearty, warm and solid throughout. Very tastefully maintained. Efficient, brisk staff wandering around with fresh beers. A perfect example of a German Alt, eminently quaffable, and possibly the most stylish beer bottles around. Quality and history. Well-maintained without tacky refurbishments. 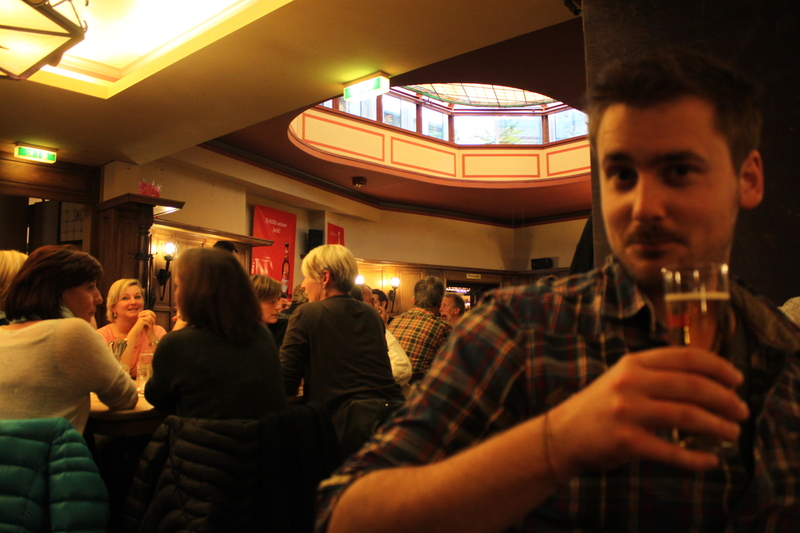 After Früh am Dom sufficiently lowered my expectations of Cologne’s bar scene, Brauhaus cemented them. 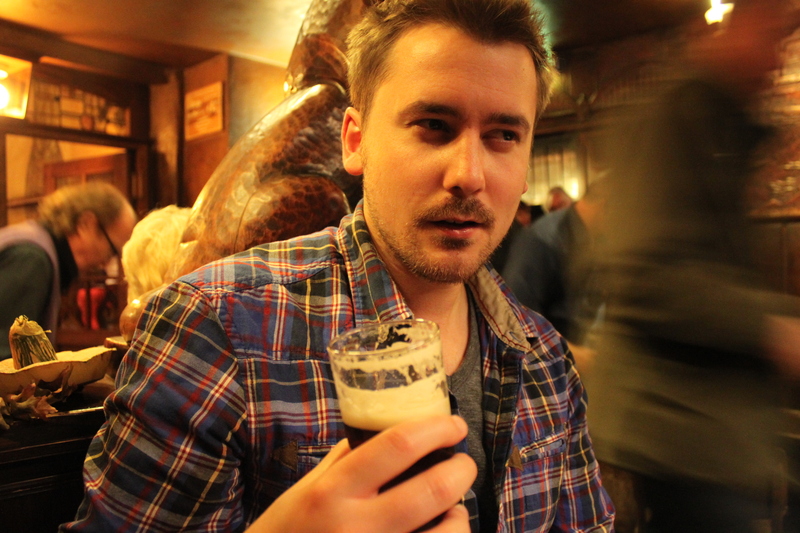 The beer is served with brutal German efficiency, albeit unsmilingly and seemingly reluctantly. 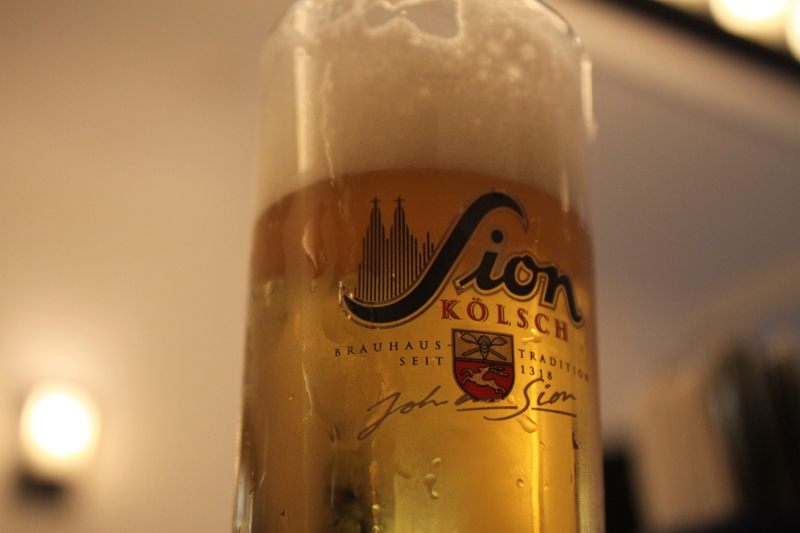 The Sion Kölsch is better than that served at Früh am Dom, but the comparison is a bit like Heineken vs. Amstel; really rather pointless, as you should be drinking almost anything else. A few of the rooms had a quaint antiquated feel about them but others, like in the above photo, were more like a coffee shop, resplendent with white walls and photos of the Nutcracker/Santa/people in stupid clothes. There’s really little nice to say about this place. Completely ordinary. Just look at the third picture. 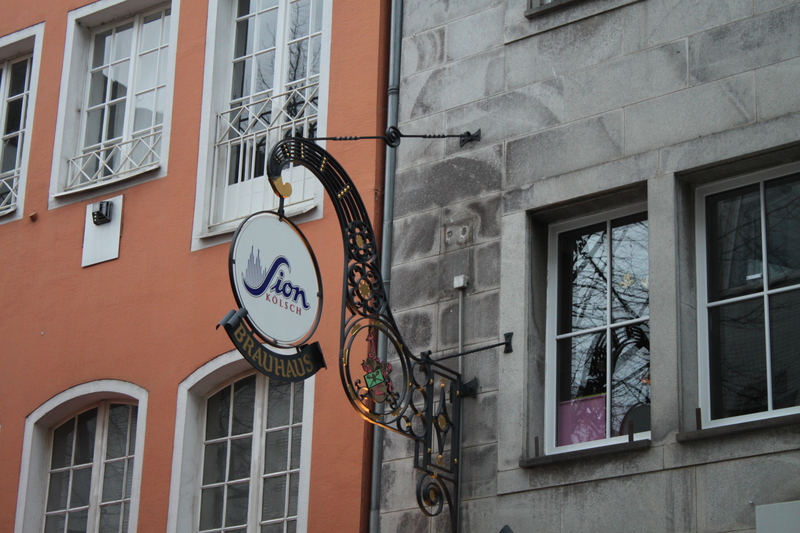 Marginally better than Früh am Dom around the corner, but still completely unremarkable. Some of the rooms look halfway decent, others are renovated without class or warmth. In truth, fairly tacky. Expect tables as plastic as the atmosphere, leery drunk ‘lads’ and a jumble of noise clattering around the room. 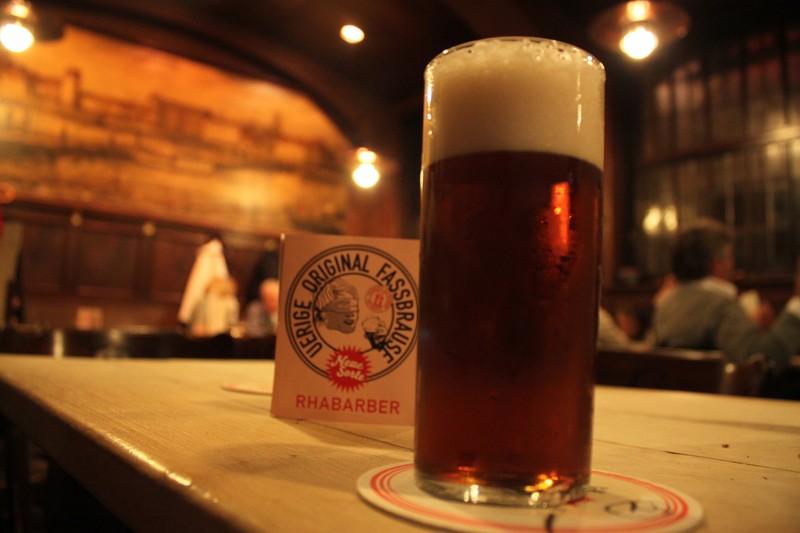 You can wash all this atmosphere down with a beer so steeped in tradition and brewed under such strict guidelines that it tastes remarkably like Heineken. It’s a hundred years of brewing tradition blah blah, but advancements have been made since then, and this stuff is really bland, train lager. 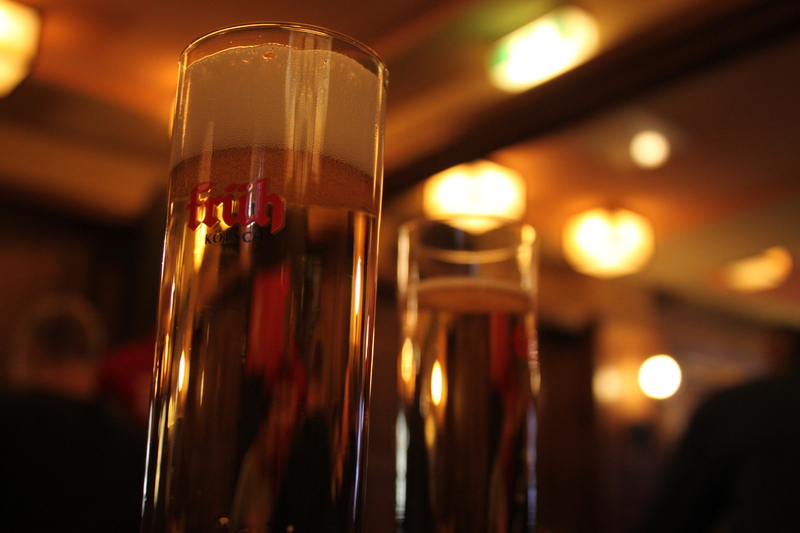 One online reviewer, lets call them the inyourpocket Essential City Guides, tells us that Früh is “Frequented by a menagerie of classy locals”. I won’t tell you that. I’d plump for brash, loutish and staring young gentlemen, and plump middle ages. Maybe this is classy in Cologne. We can agree that it is perfect for groups. You can have any beer you want, as long as it’s this one. The service is of a particular type: hurried and impersonal. 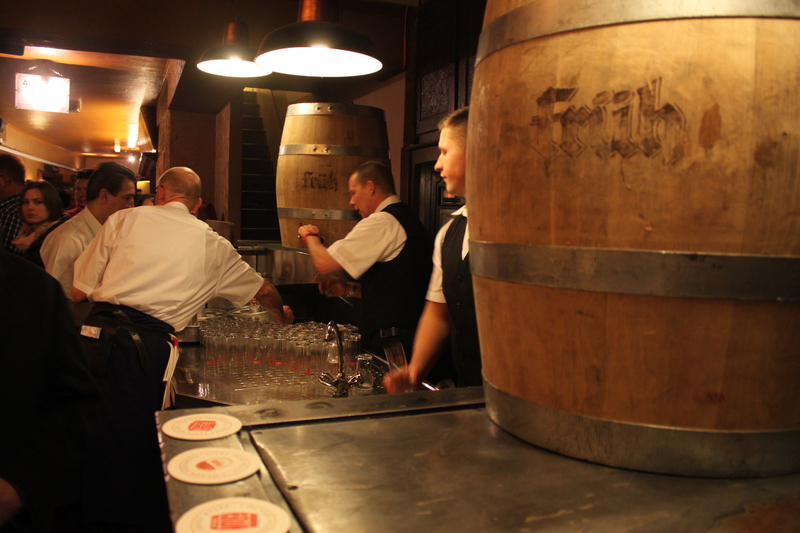 The waiters, Köbes, are exclusively men aged 29-45, and they wonder around with a Kranz of beer ready to dispense them to thirsty patrons. 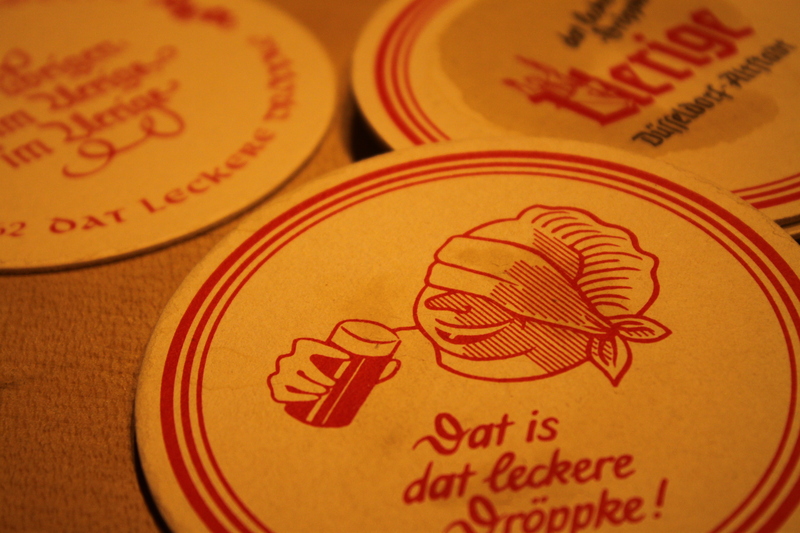 This tradition is brilliant, and they will keep bringing you new beer until you concede and put your beermat on top of your glass. I didn’t eat, but I gather it is hearty German fare: pork and potatoes presented in an enterprising variety of ways. Probably the best of the numerous rooms, but still meh. A few rooms are a bit charming, from a distance, but almost all of it is plastic, tacky and falling apart. I don’t care how old it is, it tastes like Heineken. Enjoy! 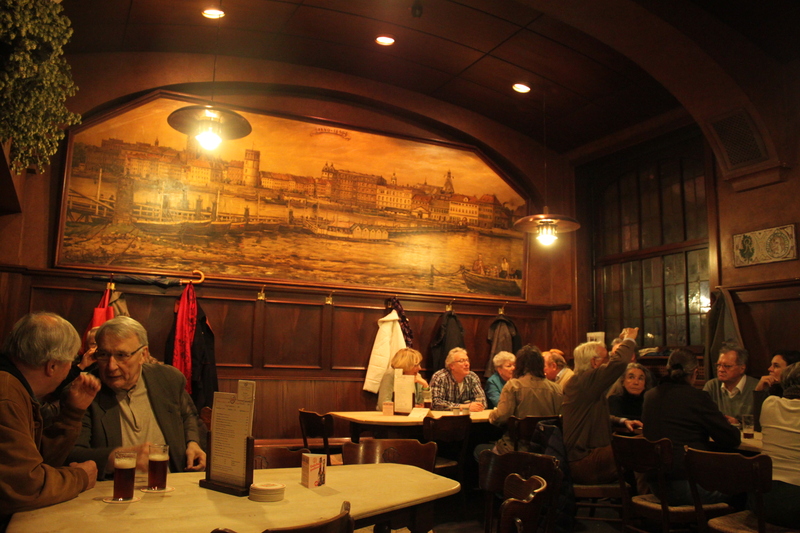 There’s a real need to have some German beer halls represented on a list of the best places to have a beer in the world. But try harder than this place.